You may not know this, but I really like reading. I like reading blogs, I like reading newspapers, I like reading my Nook. But, more than anything, I like reading books. Reading books is, more likely than not, the reason I decided to be a writer. I remember the first book I memorized and "read" outloud to my kindergarten class, Good Night, Moon (for the reason I didn't get a PhD, see this hilarious/terrifying McSweeney's piece), and I remember the first book I wrote, a treatise on feeding Shamoo when I was six. Though I don't read as much print as I'd like to, I can appreciate the book as an object, and I love all sorts of notebooks, papers, covers, and literary ephemera, and the act of sitting in a comfortable chair with a book in hand is second-to-none. I could seriously go on about them so long that you would probably stop reading, but I love them, and hopefully I'll write more about that in the near future. In the meantime, I should say that although I don't read many book blogs, I did recently win a book giveaway on We Ski Slow, which was exceedingly exciting. And by exceedingly exciting, I mean I actually did a little dance in my chair when I read the email. (I would say that I never win anything, but that's a lie. Once, when I was eight, I won a banana stuffed animal at our Fireman's Fair. Another time, at our sixth grade canteen, I won an inflatable chair. Both were awesome.) I finished the book, I Was Amelia Earhart a few days ago, and I want to pass my good luck on to one of my awesome readers. I didn't fall in love with the book, but I can't quite pinpoint why, since I've loved Amelia Earhart forever, I'm interested in reclamations of historical events, the language was lush and I was intrigued by the narrative style, which changes points-of-view at seemingly random intervals. That's a lot of reasons to like a book, but this just didn't quite hit the spot for me, so if you win the book, I'd love to get your thoughts on it. So, one lucky commenter will get a copy of this book. But wait, there's more! 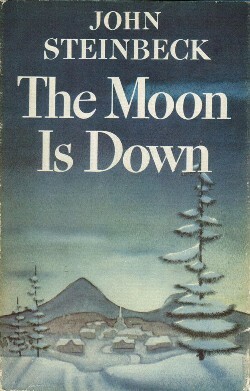 A second lucky commenter will get a copy of The Moon is Down, by one of my favorite authors of all time, John Steinbeck. (Another reason I didn't get a PhD is that all of the people I want to study are American men writing from 1920-1950. In case you haven't heard, there's a surplus of us. PS - My backup plan was Virginia Woolf. Seriously.) I've actually never read The Moon is Down, but since I've loved everything I've read by Steinbeck, I suspect this will be awesome as well. We can read it together, if you want, winning-commenter, and create a one-time book club of two. Or you can win it and never speak to me again. That's cool too. So, if you've made it this far, you must really want one of these books! Luckily, I have an average of about 2 comments on each entry, so the numbers should be in your favor. Since Meghan created such a great list of beach reads, I won't ask you to comment with your favorite book or suggestion for a good summer novel. You can if you want, but what I'd really like to know is your favorite place to read, or a particular spot that is forever tied to a book or reading in your mind. If you have a preference for which book you'd like, feel free to mention that also. I'll keep comments open for the rest of the week, and announce the winner on Saturday morning (or Monday, if I'm particularly lazy). And just in case you were wondering, my favorite place to read is my ratty armchair under a bright light next to my bookshelf. My literary linked place is Spain, which is imprinted on my mind as a burnished copy of Cat's Eye in glaring sun and 115 degree heat, on the beach, listening to Tori Amos and more passionately in love with Roger than I'd ever been with another person in my life. I love to read in bed...it brings to mind when I was younger and would sneak my flashlight into bed and read all night when I was supposed to be asleep. I love that you are continuing this. My favorite place to read is at the cabin, under the shade of the Aspens. Love this! Maybe a blog-based book club? or skype-based? I love to read on the steps in front of my house with a beer, on the bus in the afternoons, and on the right-hand side of the couch, sitting sideways,with some tea and my toes under Luke's leg. my childhood reading memory is in my parents' old laboratory- only child, no babysitter, summers were spent sprawled on the floor reading books as fast as my eyes could move. I love this idea. If I can get myself motivated to start blogging for real, I just might do this too. My favorite place to read is either in one of our awesome arm chairs at home, or outside in the summer, in the sun, under a shady tree. Nothing feels more summery and wonderful to me then that. The place that is tied to reading for me is the little nearly hidden beach in my old neighborhood. I'd go down there and read for hours, with an occasional dip in the lake.